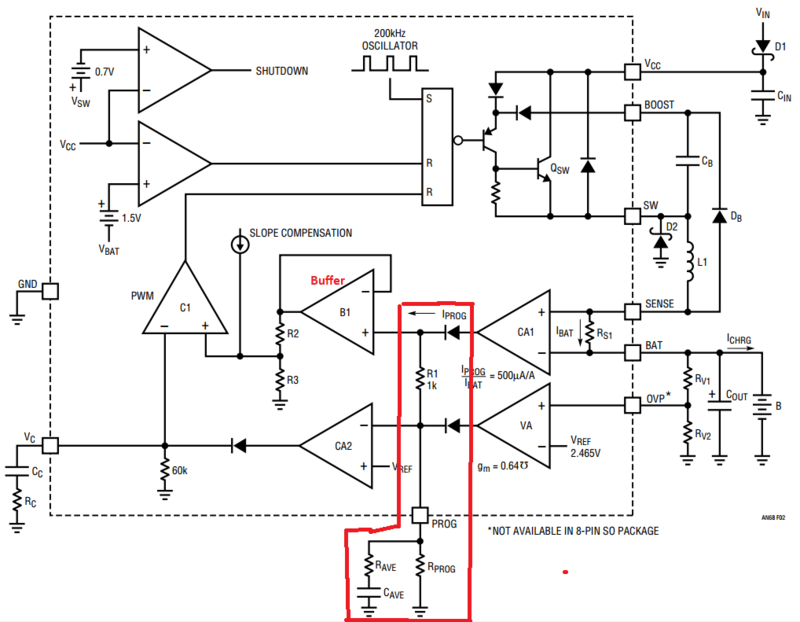 Shown below is the internal block diagram of a switched mode battery charger IC (LT1510). The LT1510 is a current mode, PWM (pulse-width modulated), positive buck switcher that operates in one of two states: constant current or constant voltage. Iam having difficulty understanding the operation and internal block diagram of IC (especially the highlighted sections). Kindly excuse my beginner level knowledge on current mode control and op-amp compensation. 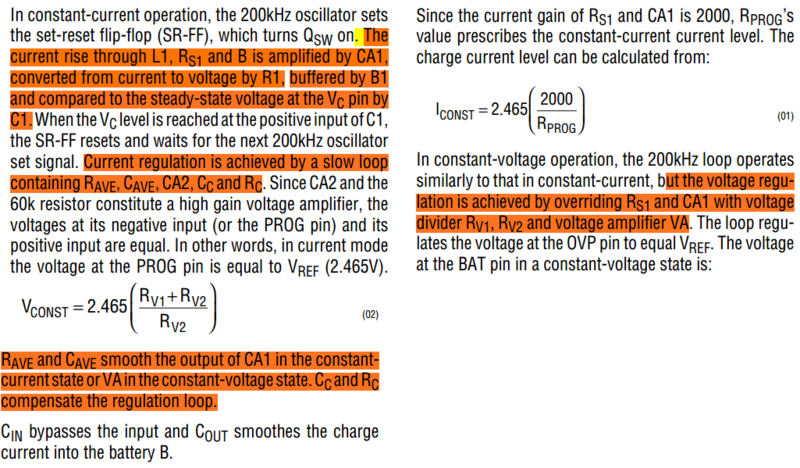 Can somebody explain how 'constant voltage- constant current' mode happens here? The current mode control employed is peak current mode control. In peak current mode control inductor current is sensed ( along with slope compensation) and compared with a control voltage derived from the voltage control loop. What is the purpose of current amplifiers CA1 and CA2 here? CA1 amplifies the sensed voltage drop from the current sense resistor. It is not an Op Amp. The CA indicates it some form of Current Amp. The two diodes then form an analog OR gate where the higher voltage controls the current rate of charge. Starting in CC mode the diode for the VA is too low. When the VA diode rises above then it enters CV mode and the diode OR output remains at the same voltage. The PROG pin filters the rate of change to make the loop stable from overshoot and ringing. the charger is controlled by a voltage controlled current from the diode OR node such that a rising voltage above CA2+=Vref turns off the battery charger current. -but this current pump is triggered in spurts controlled by a comparator for PWM that regulates the pull-up current driver by regulating the DIODE OR node voltage. is that voltage goes up and down the compared turns the pull up driver Qsw on and off and thus adjusting its duty cycle, according to the state of charge and hence the name PWM. Not the answer you're looking for? Browse other questions tagged analog battery-charging switch-mode-power-supply power-electronics or ask your own question. How does this battery simulator work? Does this solar charger PCB design satisfy the layout requirements of the step down charger? Why the implementation of current sensing network (CSN) by sensing the switch current is simpler than that of sensing inductor current? Arduino charger, can I use a step up regulator in the circuit? In SMPS , why does peak current mode control have lower gain for inner loop compared to average current mode control?